1. Head. The head is the widest part of the pancreas, and it is lodged within the curve of the duodenum. The uncinate process is a prolongation of pancreatic head (despite having a different embryologic genesis) which embraces superior mesenteric vessels. 2. Neck. The neck springs from the right upper portion of the front of the head. It is about 2.5 cm long. Its posterior surface is in relation with portal vein. 3. Body. The middle section is called the body. Is somewhat prismatic in shape, and it is covered by the posterior surface of the stomach which rests upon it. 4. Tail. The thinnest part is called the tail. It extends to the left, and its extremity comes in contact with the spleen. The pancreas is a compound gland, having both exocrine and endocrine functions. The exocrine component of the pancreas (pancreatic acini) makes pancreatic juices. These juices contain water, ions, and enzymes that help break down food. 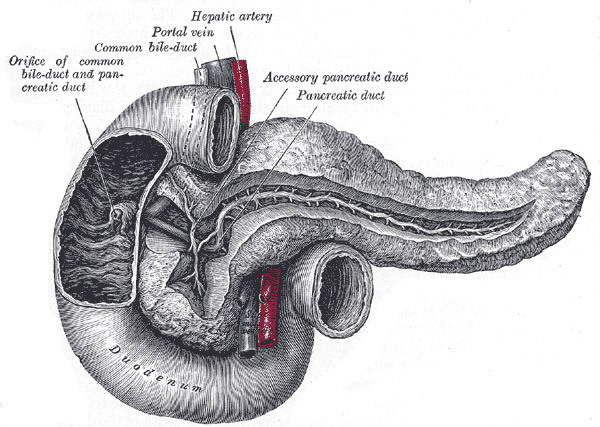 The juices flow through a system of ducts (called secondary ducts) leading to the main pancreatic duct (or Wirsung’s duct), which extends transversely from left to right through the substance of the pancreas (Figure 2). The pancreatic juices flow through the main duct to the duodenum, the first part of the small intestine. Within the duodenal wall, the main pancreatic duct ends by an orifice common to it and the common bile duct called ampulla of Vater. The area surrounding ampulla of Vater is called periampullary region. This area has a very complex histologic architecture. An additional duct, known as the accessory pancreatic duct or duct of Santorini, is given off from the pancreatic duct in the neck of the pancreas and opens into the duodenum about 2.5 cm above the duodenal papilla, in a tiny structure called papilla minor. It receives the ducts from the lower part of the head. The pancreas is also an endocrine gland that makes insulin and other hormones. The regions of the pancreas containing hormone-producing cells are called Langerhans islets (Figure 3). Hormones produced in the islets of Langerhans are secreted directly into the blood flow and travel throughout the body. They help the body use or store the energy that comes from food. For example, insulin and glucagon helps control the amount of sugar in the blood. The pancreas is in relation with many major blood vessels (Figure 4). Inferior vena cava and aorta run posteriorly to the pancreatic head/neck. The celiac tripod arises from the aorta near the superior border of the pancreatic body. It branches into the left gastric artery, the common hepatic artery and the splenic artery. Superior mesenteric artery supplies the small bowel. It originates from the aorta a few centimenters below the celiac trunk, is attached to the posterior surface of the pancreatic head, and passes down across the uncinate process. 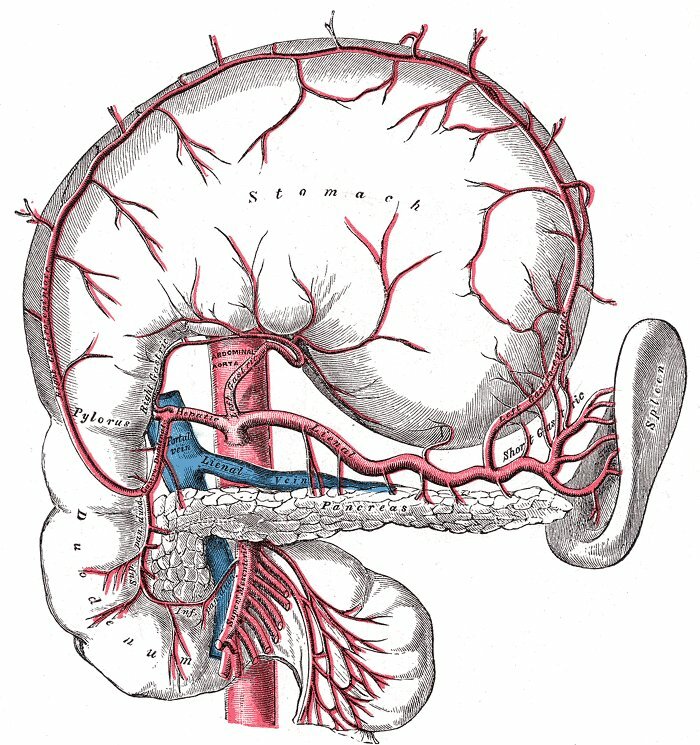 The superior mesenteric vein runs upward on the right side of the artery and, behind the neck, joins with the splenic vein to form the portal vein. Portal vein drains the blood from the gastrointestinal tract and the spleen to the liver.